With G.W. Hearing Conservation and Civic Audiology Ltd. In general, poor acoustics have the potential to permanently harm hearing and voices of teachers in particular, because they tend to spend their days in the same rooms. Further, research shows that behavioural problems improve, stress and fatigue reduce, and learning is improved when students can hear the teacher clearly. 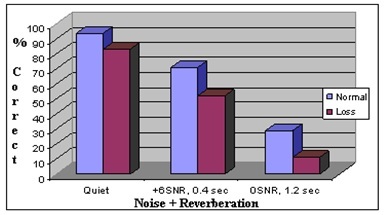 The issues related to ambient noise levels and reverberation in the educational setting can be viewed from two perspectives; the effects on the educator and the effects on the students. The negative effects are different for each and can be reduced through proper management of the educational environment. In some situations, by teaching in poor acoustical environments, educators are risking their health, such as suffering hearing loss, voice damage and non-auditory effects of noise. Children risk lower academic achievement and the non-auditory effects of noise. A difference of 3 to 5dB may seem insignificant but with every 3dB increase in intensity sound has doubled. Therefore to increase speech by 3 to 5dB and maintain that level above the background noise can take considerable effort. The task of speaking above a normal level for an extended period of time, as well as being in a noisy situation for and extended period of time has also been linked to excessive fatigue and increased stress levels. These are the non-auditory effects of noise. A more detailed list of the effects can be seen in Table 2. When the acoustics of an environment exceed the recommended levels for the usual activity ascribed for that facility then the risk for the non-auditory effects increases. setting. The majority of research has centered on the children’s ability in math and literacy as these are easily measured and improvements related to improved acoustics can be re-measured. 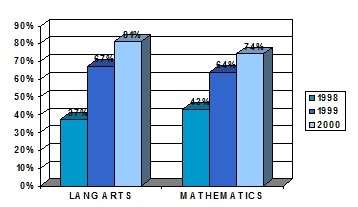 The following figures illustrate the significant benefits for the students in being able to hear the teacher clearly. The difference is not in the audibility of the speech but in the clarity of the speech. Poor acoustics will mask or cover the high frequency consonants required for speech comprehension. The improved acoustics which should be multi faceted: reduce background noise and reverberation and enhance the teachers’ voice through amplification. 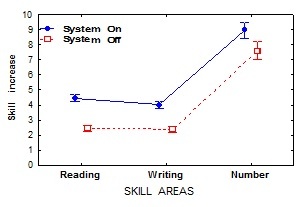 Figure 1 The upper line indicates the level achieved by the classes with amplification in each of the skill areas compared to the un-amplified classes, the lower line. (Massie, R and Dillon, H). The impact of poor acoustics has a greater impact on children who have reduced hearing ability. The range of ‘normal’ hearing in adults is between 0 decibels (dB) and 25dB. On the dB scale the larger the number the louder or more intense the sound is. When testing hearing, the audiologist determines the least intense sound an individual can hear at a variety of frequencies or pitches of sound, this is their threshold of hearing. The larger the number for an individual’s threshold the louder the sound required for the individual to just barely hear the sound. For children the range of normal hearing has been reduced to 0dB to 15dB. Bess (1998) in researching the educational outcomes of children with minimal sensorineural hearing loss discovered that two thirds of this group had thresholds no worse than 25dB, considered ‘normal’ for an adult. These children had significantly greater academic difficulty than children with ‘normal’ hearing. In fact they discovered that on average 37% of the grade 3, 6, and 9 children in the study repeated a grade compared to the rate of less than 10% for the school district. These studies underline the importance of ensuring the teachers’ voice is audible to all children. The measures of being able to hear clearly are not limited to academics, in 1998 Palmer reported on the changes in time on task and inappropriate behaviours. This study found significant improvements in all behaviours measured for all children. 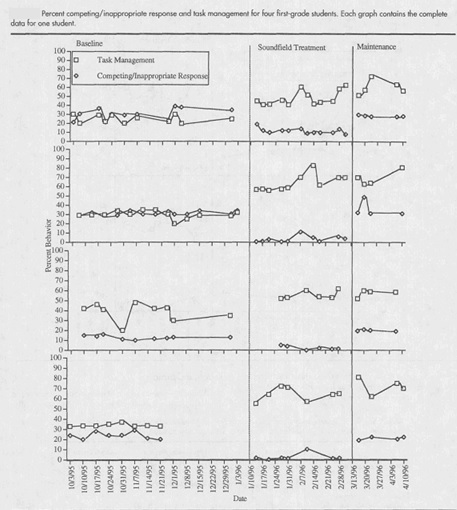 Figure 4 is an example of the data presented in this report. The teacher was unaware of which student was being monitored and the teacher’s classroom behaviour did not vary significantly throughout the course of the study. The only manipulation performed was the introduction of a soundfield system. These systems boost the teacher’s voice throughout the classroom by approximately 6-8dB. This is loud enough for the children to hear the teacher clearly wherever the teacher is standing in the room and not loud enough to be heard by an adjoining classroom. In the Palmer study in the ‘Baseline’ section of the figure the teacher is wearing the microphone for the sound field system without the system being turned on. In the ‘Soundfield Treatment’ section the soundfield system was turned on. In the ‘Maintenance’ section the soundfield system was turned off again. It is easy to see in Figure 4 that significant changes in behaviour occurred immediately with the increased audibility of the teacher. Evans, Gary W. and Stephen J. Lepore. (1993). “Non-auditory Effects of Noise on Children: A Critical Review.” Children’s Environments 10(1): 42-72. A cost benefit analysis of improving the acoustics, that is, reducing background noise and reducing reverberation, will demonstrate that improving the acoustics will over the long term cost less than providing less expensive but poor acoustically designed rooms. In addition, research is indicating that enhancement of teacher audibility with sound field amplification brings further educational benefit. The Province of New Brunswick has made the priority to amplify all kindergarten to grade 3 classrooms. They have committed to this process with purchase of 165 sound field systems in 2006. The Miramachi School Board has outfitted all P-3 classrooms with soundfield systems. The benefits to the quality of education are well demonstrated, but improved acoustics and the systems can pay for them selves through reduced time off for teachers due to vocal and stress related illnesses. The recommended acoustics, background noise levels and reverberation, vary depending on the most common use of the room. The more instruction that takes place in the room, the lower the level of recommended background noise and reverberation required to ensure an adequate learning environment. A gymnasium needs to have reverberation control if it is used as a teaching space the lower reverberation time improves the noise level and improves comprehension for the students. Reverberation control for ancillary and large core learning spaces. For ancillary spaces, such as corridors, gymnasia, cafeterias and large core learning spaces [volume. 566 m3 (. 20 000 ft3)] sound-absorbing material should be installed to reduce noise caused by the activities of occupants, as well as to control reverberation. The amount of acoustical treatment will vary widely, but corridors should generally have a total surface area of sound-absorbing material that is not less than 50% of the ceiling area and up to 75% if possible; 75% treatment area is recommended for corridors with high traffic or noisy lockers. A measure of the sound absorption coefficient of acoustical materials is provided by a single number rating called the noise reduction coefficient (NRC), [C4, C5]. For cafeterias and for large core learning spaces with ceiling heights up to 3.7 m (12 ft), a suspended ceiling with an NRC of 0.70 or higher should be used for the full ceiling area exclusive of the area required for lights and ventilation grilles. Higher NRC ratings should be considered especially for ceiling heights less than 3.7 m. When the ceiling height is greater than 3.7 m (12 ft), especially if greater than 4.6 m (15 ft), a more detailed analysis by experienced personnel may be required to provide adequate control of reverberation. In any event, as suggested by table C.1, wall treatment should be included for such high ceiling rooms. Depending on the amount of wall treatment, the ceiling NRC or treated area might then be reduced when some of the wall area is covered by sound-absorbing material. When permitted within sanitation restrictions, similar acoustical treatment should be employed in food-serving and food-preparation areas. NOTE: The Noise Reduction Coefficient is equal to the arithmetic mean of the sound absorption coefficients at 250, 500, 1000, and 2000 Hz, rounded to the nearest multiple of 0.05. The NRC of acoustical material should not be used for design or calculation of reverberation time for core learning spaces for purposes of this standard. including additional sound-absorbing material on the walls in corridors connecting noisy rooms to quieter areas of the school and in corridors with busy foot traffic or noisy lockers. [C5] W. Cavanaugh and J. Wiles, Architectural Acoustics Principles and Practice, Wiley, NY, (1999). [C6] M.D. Egan, Architectural Acoustics, McGraw-Hill, NY (1988), San Francisco, CA (1998). [C7] R. Coffeen, et al., ‘‘Classroom Acoustics, a resource for creating learning environments with desirable listening conditions,’’ Acoustical Society of America, Melville, NY, (August 2000). The ideal reverberation time varies depending on the source consulted. “Acoustics.com” recommends the following reverberations times for gymnasiums. Because of the size and the materials typically used in this type of space, a gymnasium can become very reverberant, causing a tremendous build up of noise and difficultly understanding the PA system. Absorptive materials are needed to help control this reverberation. Ceiling and/or wall treatments are necessary. If the space is also used for assemblies, meetings or other activities, reducing the reverberation time is even more critical. 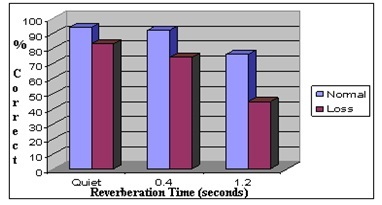 The reverberation time needs to be below 2 seconds if you are just concerned with gymnasium noise, but in order to facilitate other activities, a reverberation time of 1-1.5 seconds is ideal. A reverberation time of above 2 seconds is unacceptable. Given the activities taking place in a gymnasium, and the equipment used for these activities, durability is a critical factor when choosing acoustic materials. National Research Council Canada recommends reverberation time of 1.0 seconds for gymnasia. (Warnock. A.C.C) The closer the reverberation time is to the recommended level of 0.7 seconds for classrooms the better the comprehension of speech by the students. The slightly longer reverberation time is allowable in this situation as it aids in speech transmission over longer distances. The gymnasium is larger than the typical classroom therefore if too much of the speech signal is absorbed then the teacher would need to increase their speaking volume to project their voice that extra distance. The ideal ambient noise level for a gymnasium also varies depending which reference was used to assess the noise level. Some recommend using dBA and dBC measures. Others recommend using Noise Criteria (NC) or Room Criteria (RC) curves or a modified version of these curves Balanced Noise Criteria curves of RC Mark II. The final four use specific intensities measured at specific frequencies to determine whether the ambient noise level meets or exceeds the recommended value for the given space. NC (also known as NCB, or balanced noise curves): Noise value is based on ANSI standard S12.2-1995 (ASA 115-1995) Criteria for Evaluating Room Noise. It uses ANSI Class 1 octave-band filters to divide the sound spectrum into 9 octave bands, measuring the SPL level of each band. Then, the results are compared to a table of values defined in the specification. The table lists noise criteria numbers by row, with each row having values defined for each octave band. The NC band is defined as the lowest band number for which none of the octave-band SPL values for the row are exceeded. Acoustics.com recommends the following noise level. Even if everything else is controlled perfectly, the space might be negatively impacted if the background noise (e.g. HVAC system) is too loud. To help protect your design, the NC level should not exceed 35 to 45 (when used only as a gymnasium), 35 to 40 (when used only as a multipurpose room). When specifying NC, specify an actual rating, such as NC 20, rather than a range, such as NC 20-30. Although specifying a lower number will ensure minimal background noise, it might be cost prohibitive to achieve. Be realistic about the amount of acceptable noise and the project’s budget when specifying an NC level. The single dBA ambient noise level is consistent across many resources. For a multipurpose gymnasium 40dBA is the maximum intensity. The ANSI S12.60-2002 standard recommends 40dBA or less for the ambient noise level. This is measured in an unoccupied gymnasium. The standard recommends performing dBA and dBC readings to determine if excessive low frequency noise is present. Low frequency noise will mask or interfere with speech to a greater degree than high frequency noise. Low frequency noise also is more prevalent due to mechanical ventilation systems, fluorescent lighting in buildings. 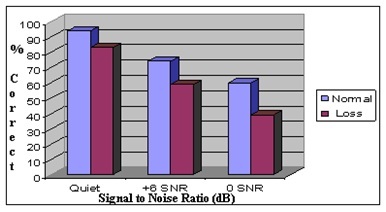 Low frequencies due to their physical nature transmit easier through walls; therefore classroom to classroom noise transmission can be an issue. Other common sources that are external to the school are traffic noise and aircraft flyover noise. NRC Canada recommends between 40 and 45dBA for gymnasiums. The benefit of frequency specific analysis is that the low frequency noise, which would not be detected by the single value assessment i.e.dBA, can be assessed and proper remediation to reduce these sounds if necessary to the acceptable levels can be developed. These recommendations represent the methods for assessing acoustics for teaching spaces. Recommendation 2. The use of an octave band analyzer or digital recording and spectrum analysis of the frequency content of the ambient noise levels should be carried out prior to occupancy. This should be performed during the daytime and night time on a weekday, Monday to Friday, to determine the level of noise contribution from the HVAC versus external sounds entering the building. Recommendation 3. A sample of classrooms shall be assessed for noise levels along with all music rooms, gymnasia, and cafeteria. Classrooms without acoustic ceiling tiles have the potential to have excessive noise due to the reduced quantity of sound absorbing material. Recommendation 4. If cafeteria are to be used as multipurpose rooms then they shall be assessed the same as the music room and gymnasia. Recommendation 5. When the facility is designed the architect predicts the reverberation time (RT) based on the dimensions of the space as well as the materials used to construct the space. Following the building of the facility the RT should be validated. Reverberation will affect the effort required for effective communication for all occupants of the room, and therefore the educational processes. The reverberation assessment should be carried out using a broad spectrum random noise such as a starter pistol or popping of a balloon. The noise created should be recorded and the RT60 determined. The RT60 is a measure of how long it takes a sound to be reduced from its peak value by 60dB. The RT60 should be determined at several locations and averaged together. The RT60 should be measured and calculated for 500Hz, 1000Hz and 2000Hz. The “loudness equivalent or Leq”, which is an average equivalent value, which can be interpreted as “the amount of sound intensity (loudness) experienced over time. The average of which is the same as if the employee had been exposed to that one intensity value over the entire work day.” This measurement relates to an 8-hour workday. The Leq values can easily be compared to the Nova Scotia Department of Labour threshold limit values for compliance. The “dose”, the Nova Scotia Department of Labour threshold limit values list the maximum period of time, in hours and minutes, for exposure to sounds of specific intensities. When an employee reaches that maximum exposure intensity for the given time, the dose is rated at 100%. In assessing a dose reading, it is the percentage of sound the employee has actually received; if that dose exceeds 100%, the employee has been exposed to more noise than the Occupational Health and Safety law allows. Note: The variability in reverberation time is accounted for by the size of the room. The larger the room the greater the reverberation time allowed. For the music rooms the volume of the room needs to be considered in construction with a minimum of 17 cubic meters allowed per student. Due to the clear evidence of the importance of acoustics on educational outcomes and safe work environments in schools. It is critical to provide educators with facilities with acceptable acoustical performance to ensure a safe and healthy work environment that enables learning. Whitehead, G.W. and Sharpe, M.; Hearing Conservation and Civic Audiology, Music Room and Gymnasia Assessments for Halifax Regional School Board. Multiple Assessments. Jiang, T. Risks of Noise-Induced Hearing Loss for Physical Education Teachers. Journal of Occupational & Environmental Medicine. 39(10):925-926, October 1997. Smith E, Gray SD, Dove H, Kirchner L, Heras H., Frequency and effects of teachers’ voice problems. J Speech Lang Hear Res. 2004 Apr;47(2):281-93. Spengler, JD; Samet JM and McCarthy, JF. Indoor Air Quality Handbook. McGraw Hill 2001, Ch, 19, page 19.13. Acoustical Society of America Journal, Volume 118, Issue 3, pp. 1842-1843 (2005). Warnock, A.C.C. Specifying Acoustical Criteria for Buildings; Construction Technology Update No. 50, June 2001.